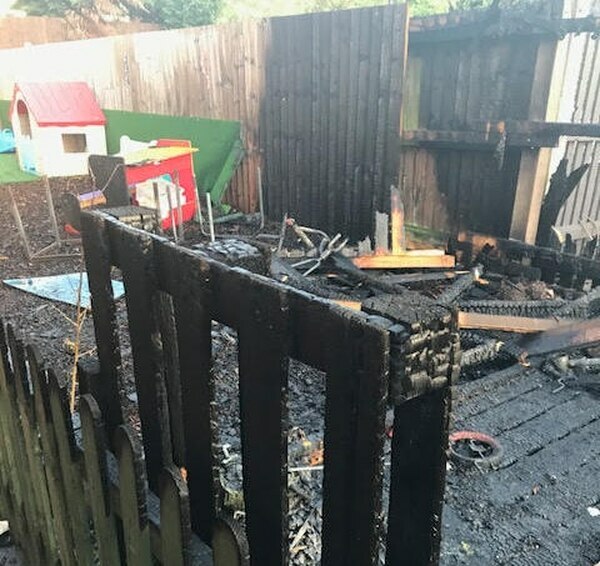 Arsonists set fire to a nursery playground, causing thousands of pounds worth of damage and leaving staff and parents distraught. Flames spread across the garden and reached the main building but fire crews were able to stop the blaze from causing further damage. 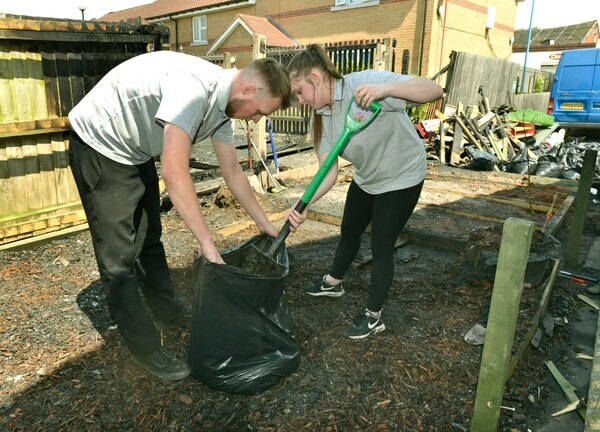 Staff arriving for work at Little Explorers Day Nursery in St Anne's Road, Cradley Heath, yesterday pitched in to help clear up the damage. Police are treating the blaze as arson. Owner Kelly Shaw, aged 36, called the attack 'mindless'. Firefighters were alerted just after 2am yesterday, arriving to find the shed, fencing and artificial turf alight, with flames starting to engulf the kitchen at the back of the nursery. The shed, eight tricycles, picnic tables, benches, chairs and outdoor toys were all destroyed in the fire. Among the equipment burned was a bouncy castle which had been donated to the nursery only days earlier. Ms Shaw, who launched the nursery five years ago, said the outdoor play area had undergone a major £5,000 revamp just last year. She said: "This was a mindless act. It's crazy how much damage has been done. We'd only had the bouncy castle for one day, now it's gone. "I'm gutted anyone would want to target a nursery of all places. Nothing like this has ever happened here before. All I can say is thank God it didn't affect the inside of the nursery." The windows, shutters and outside lights at the back of the building were damaged in the blaze, while the air conditioning system was also put out of action. Police are looking at CCTV footage from the scene, about 150 yards from Tesco, on Foxoak Street. It is believed two people were involved in the attack after climbing over the fence by standing on a bin. The nursery, which employs 21 staff, has 114 youngsters in its register. 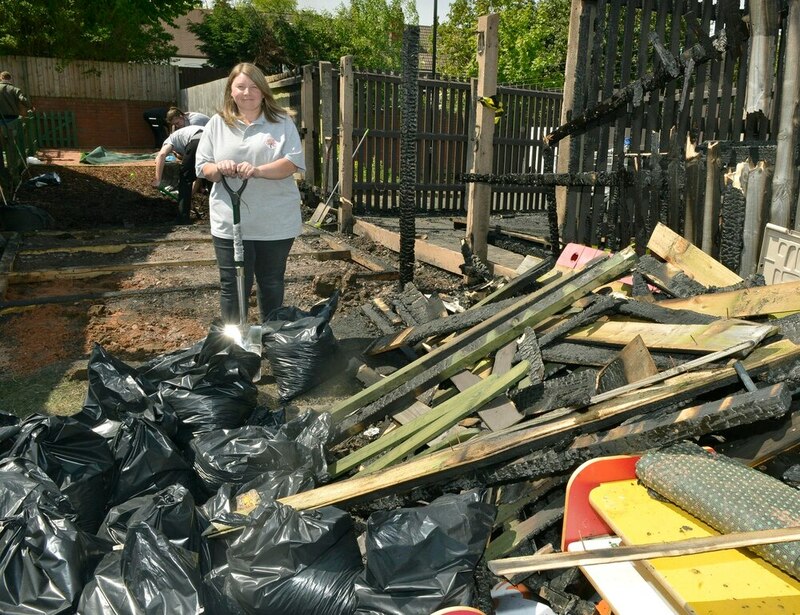 Stacey Cope, one of the parents who helped in the clear-up operation, said: "The emergency services checked that the premises were secure so luckily Kelly hasn't had to close the nursery. "This has shaken her but fortunately it seems to have been a random attack. She's put her heart and soul into the business and it's a really popular nursery. "She had to ring round all the parents early yesterday asking them to keep their children away for the day if they could. "Some parents could, some couldn't. It's meant that the children have had to stay indoors on a nice sunny day instead of playing outside." A justgiving page – www.justgiving.com/crowdfunding/littleexplorers – has been set up to raise money to replace some of the damaged items and had already hit its £500 target by Friday morning.